Distribution: Bering Sea and Aleutian Islands to southern California; Kuril Islands and Sea of Japan. Giant Pacific octopuses are solitary animals. Only near the end of their 3-6 year life span will they seek out a mate. The male passes a spermatophore into the female’s mantle during mating. The female has up to 6 months to use it to fertilize her eggs. Up to 100,000 eggs are laid in long, braided strands and attached to the roof of a well protected cave. The female will stay with the eggs, guarding them from predators and keeping them clean and aerated for the 6-12 months it will take them to hatch. She will not feed during this time. When the eggs hatch the young octopus are about the size of a grain of rice and planktonic, floating near the ocean surface. It is not well documented how long they remain in this stage before settling out on the ocean floor and assuming a more octopus-like appearance. In recent years, much research has been done into the status of octopus population in the north Pacific. The short life span and reclusive tendencies of this species have proved a challenge for researchers. 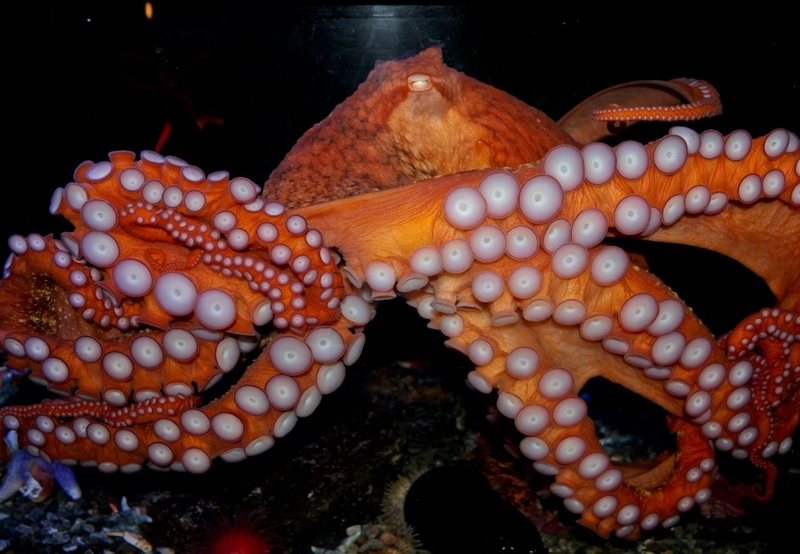 Populations of giant Pacific octopus are thought to be stable in the north Pacific and increased popularity in the human food market has increased their value as by-catch in commercial fisheries that use pot gear. Octopus are in the mollusk phylum (snails, clams, chitons) and more specifically are members of the class Cephalopoda which includes squid, cuttlefish and nautilus. There are at least 3 other species of octopus found in Alaskan waters but the giant Pacific octopus is the most frequently encountered. A 50lb octopus can fit through a 2 inch hole. Their parrot-like beak is the only hard part of their bodies. Octopuses are sometimes called the “chameleons of the sea” with the ability to change the color and texture and of their skin and seemingly disappear right before your eyes.